Terrigal is a popular residential, tourist and retirement centre with a bustling holiday ambience which is modified by the gracious Norfolk pines along The Esplanade, the pleasant beach front walkway which heads south to Broken Head, and the dominating natural feature known as 'The Skillion' which offers dramatic views up and down the coast. Visitors are attracted by the town's classy four and a half star hotel, the fishing, swimming, surfing, boating and the coastal scenery. Terrigal Beach is one of those glorious beaches which stretches, unbroken, for four kilometres and is known as Terrigal at the southern end and Wamberal at the northern end. The Skillion is the most prominent landmark of the region, with a steep cliff facing the ocean rising to a convenient lookout area that is easily accessed by a flat grassy area leading up from the reserve. This image belongs to the travel and nature stock photo library. This stock photo of The Skillion at Sunrise is available for licensing for commercial and editorial uses including websites, blogs, books, magazines, brochures and advertising. Restrictions may apply for images which contain third party copyrighted material or sensitive subjects. Photos of artwork are for editorial use only. 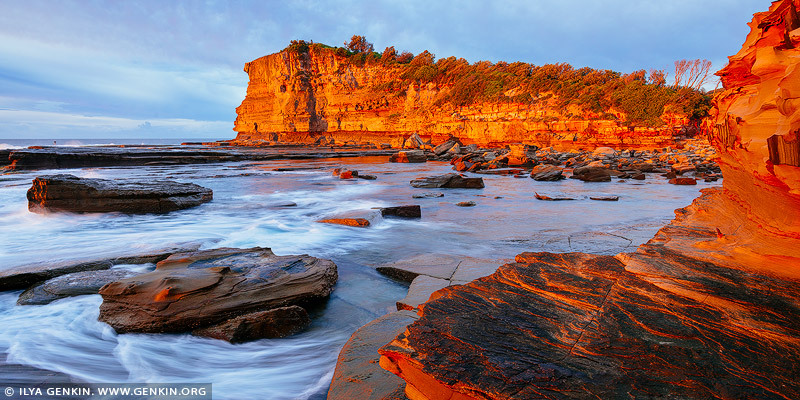 This image id SKILLION-TERRIGAL-0001 of The Skillion at Sunrise, is copyrighted © by Ilya Genkin. This is not a public domain image.